Over the next few months - I will be trying several new recipes. I hit the wall sometimes when it comes to cooking. Who wants to eat the same thing every day - well other than my husband. But for some reason ideas just don't naturally spring to mind. For me, it's in wandering through the way other people create food, that I flex that inventive muscle. Cookbooks, newspaper food sections, magazines and cooking shows alway inspire me. It's here new taste combinations can be safely explored and other ways of using a common ingredient are offered. With so many now embracing Gluten Free diets, I am always looking for tasty ideas. Any recipe using gluten free flours are ignored for the most part as I worry about the process to make them something they were never meant to be. What I look for is the use of alternative flours that are naturally gluten free. For main dishes, they should be created without the need for pasta or bread and still be filling. Better Homes and Gardens published an article with over 30 Gluten Free Recipes recently - all under 500 calories if you eat the suggested serving size. There were several I thought had strong possibilities and selected two to try this week - Baked Spaghetti Squash and Pork & Green Chili Stew (a crockpot offering). I tried the first last night. The second I will be trying Sunday, so be sure and check back. 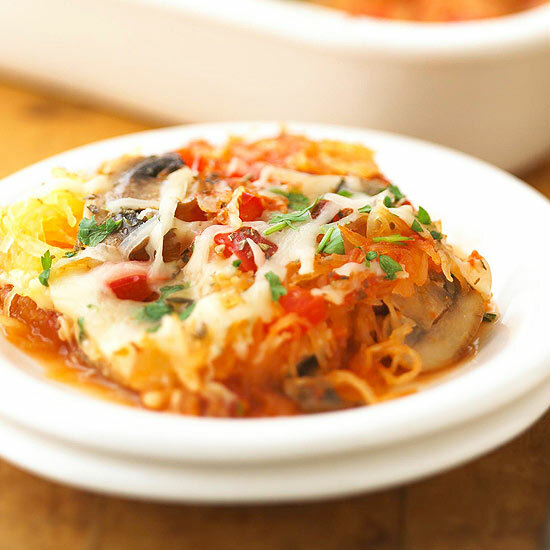 I have struggled with how to best use Spaghetti Squash for a long time, mostly using it as a pasta/rice substitute topped with sauce or stir fry. Layering the sauce, meat, cheese and squash this way created a lasagne-like dish that was full of flavour. The recipe says 6 servings - but with my big eaters, 4 servings is probably more like it. I might try this again and take it in even a more lasagne-like direction by adding a layer of ricotta cheese and spinach, but loved it just this way. If calories are an issue - this way is definintely a better choice. Other possibilities arise such as a layered tuna casserole, but that will be an idea for personal exploration later. See what just happened here? It's true - as soon as you begin to look at food through another cook's eyes, new ideas seems to evolve naturally. Hope you enjoy this recipe as much as I did. Note - No dairy either? I found this great article on How to Make Fresh Vegan Moxarella. Haven't tried it yet, but when I do I will add my thoughts. Halve squash crosswise; remove seeds. Place cut sides down in 2-quart rectangular baking dish. Add 1/4 cup water. Cover with vented plastic wrap. Microcook on high power 13 to 15 minutes or until squash is tender when pierced with fork; rearrange once for even baking. OR you can cover with foil and bake in a 350 oven for about 30 minutes. Scrape pulp from squash (about 3 cups). In a large skillet cook sausage, mushrooms, sweet pepper, onion, and garlic over medium heat until sausage is no longer pink; stir to break up sausage. Drain off fat. Spray baking dish with non-stick spray. Spread half the squash in dish. Add half the sausage mixture and half the olives. Sprinkle with Italian Herbs and 1/8 teaspoon black pepper. Top with half the sauce and half the cheese. Top with remaining 1/2 squash, 1/2 sausage, 1/2 olives, and 1/2 sauce, but reserve the remaining 1/2 cheese for later. Bake uncovered for 30 minutes. Sprinkle with remaining cheese. Bake for 5 minutes or until cheese is melted. Let stand 10 minutes. Sprinkle with parsley. Makes 6 servings.